April, 2018 - TEAM attends JEC Composites 2018 in Paris, France. On March 6-8 T.E.A.M. attended the 2018 JEC World Composites show in Paris, France, widely recognized as one of the largest composites shows in the world. T.E.A.M. 's display booth included samples of our 3D woven preforms and billets, as well as composite components that utilize these preforms. T.E.A.M. 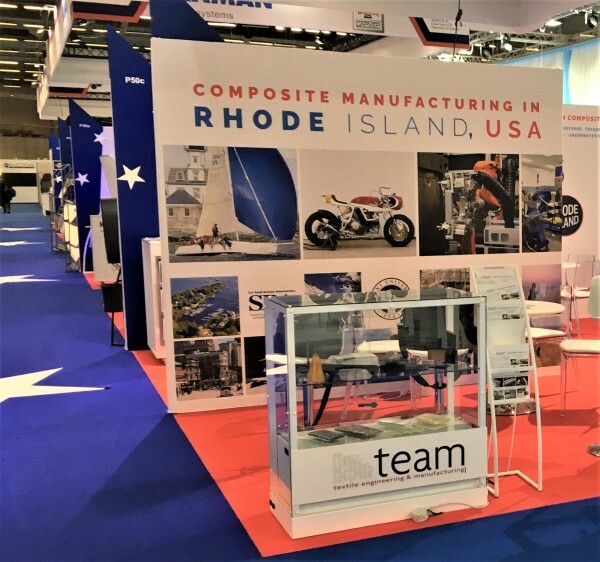 's booth was co-located in the "Rhode Island" section of the show floor along with other composites related companies doing business in the State of Rhode Island. T.E.A.M. is proud to announce a succesful upgrade of our quality managment system from AS9100C / ISO 9001:2008 to AS9100D / ISO 9001:2015. The upgrade was needed to adapt to a more complex and changing global network. T.E.A.M. is dedicated to continual improvement and driven to deliver quality products and service to our customers. T.E.A.M. is a learning company! We are pleased to announce the following continuing education activites completed by our employees in 2017: Three of our members attended a ten week class on 5S, Lean and Safety in Q4 of 2017 and then implemented projects based on what they learned. The entire facility completed several sessions on safety. One employee reached Level 5 on her ESL classes. Finally, two of our employees completed a ~9-month executive certificate program in "Design for Manufacturing Innovation" facilitated by the Rhode Island School of Design and Commerce Rhode Island.